Philip Jones Griffiths (UK), one of the most extraordinary photojournalists of the Magnum agency, is best known for his 1971 book Vietnam Inc., a remarkably systematic and eloquent photographic condemnation of the âAmerican War'. 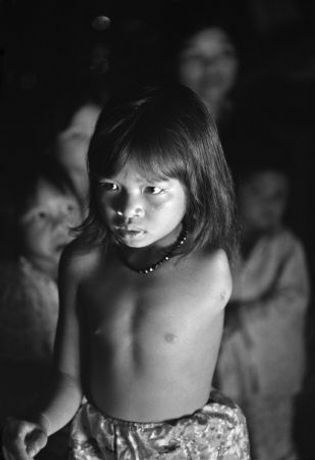 Cartier-Bresson said of his work that not since Goya had anyone portrayed war like Philip Jones Griffiths. Yet Griffiths did not merely chase wars, but over a period of more than thirty years, until his death in 2008, continued to go back to Vietnam to document the effects of the conflict, and the changes brought to the country first by the Communist government and then by market âreform'. In particular, he pursued with great tenacity a story few wanted to talk about or hear about: the horrific legacy of the defoliant Agent Orange that was sprayed from the air over great swathes of South Vietnam. The active chemical of the defoliant was dioxin, one of the most toxic substances known, and one which lingers in the environment and the body, causing cancers and genetic mutations. Griffiths went to the hospitals to photograph the afflicted, showed how families, schools and medical staff dealt with them, and the resilience and courage of many of those worst affected in their struggles to do things many of us take for granted. In the US, many of the military personnel who merely had to handle the chemical, loading it on to the crop-spraying planes, have received compensation for their resulting sicknesses. For the Vietnamese, on whom it was sprayed, and whose environment was devastated, there has been, so far, nothing. Indeed, it was a condition of Vietnam's re-admission to the world of trading nations that it pay compensation to the US for the cost of the weaponry used to devastate it. A court case for the Vietnamese victims now makes its way through the US courts, and Griffiths' book, Agent Orange, from which this exhibition is drawn, has been an important catalyst in its prosecution.